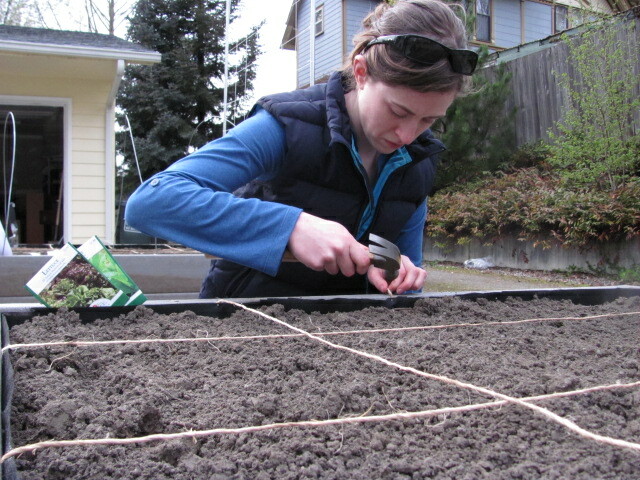 Last week was spring break 2.0, Alaina’s high school was on break so we got down to business with the garden! Whew, we got a lot done! Our new house has a great little yard on a green belt that makes it feel bigger than it is. The downside is that the green belt provides a lot of lovely shade that won’t work for growing good veggies. Our solution: we built raised beds on our very sunny and large driveway! For people who live in an urban environment with limited yard space the traditional raised bed garden (six-inch bed on top of soil) can present a challenge. These self-contained garden beds can be built almost any where that will allow for good drainage. I extensively research gardening methods for the short pacific northwest season. I found Mel Bartholomew’s Square Food Gardening which, with our limited space, seemed to make the most sense. I encourage you to check out his website and book but to ultimately go with whatever style works for you and your growing season. We wanted to make sure our beds were built sustainably without treated wood so we went to the Habitat for Humanity ReStore, a used building supply warehouse. We hit the proverbial jack-pot with a whole pile of Trex 1×6 decking which worked perfectly and only cost $1.50 a foot. We made two beds, a 4-foot-by-4-foot square and an 4×6 foot square, each one is 16″ deep. ( You need at least 12″ for your veggies to grow successfully but a little extra room is good if you can.) Which gives us 40 square feet of gardening space. Alaina cut the boards, drilled holes and screwed them together at the ends. The she drilled and screwed them into a corner post, to secure them. We did them three boards high to make sure we had enough soil depth. Then we lined them with landscaping cloth to keep the soil from washing away when we water. There are a couple different options when it comes to landscape cloth, be sure to choose one that allows water and air to flow through and doesn’t have weed-killing chemicals on it. Our roll was 3 feet wide by 80 feet long and we had plenty. We attached it to the top edge of the frame on all sides. You can kind of see it in the picture. It was completely lined and had a little overlap on the bottom to make sure the soil stays in the bed. Once they were lined we put them in place on our drive way. We filled them with an organic gardening mix from Great Western Supply (1/3 top soil, 1/3 sand, 1/3 compost). It took just under 2 cubic yards to fill both beds and we will have extra to add as it compacts throughout the season. We constructed trellises out of steel electrical conduit with corner connectors attached to the bed frame with PVC pipes and fastener. We tied nylon garden trellis, found in the garden section of most hardware stores, to the frame. (We still have one more trellis to make so I’ll take some more pictures so it makes sense.) The trellis allow for vertical gardening. Cucumber, tomatoes, peas and other creeping plans grow up the trellis allowing them to fit in a smaller space. You can even grow small pumpkins and winter squash vertically! Since we are trying out the Square Foot Gardening, we measured and marked off the bed into square feet with garden twine. You could use most anything just so you can tell where the squares are, it’s not the kind of thing you want to eye-ball. With the Square Foot Method a different number of each kind of plant can fit in a square foot. 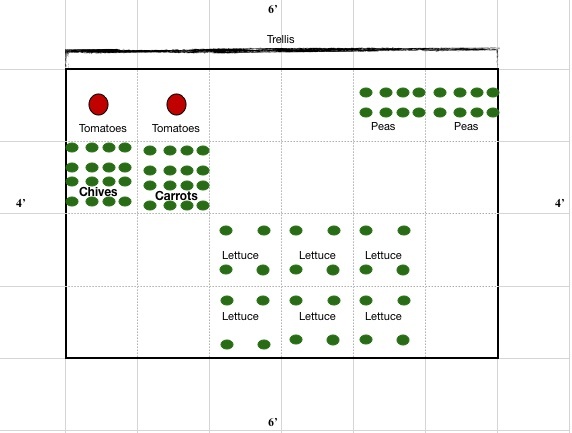 In one square you can have 4 lettuce plants, or 16 carrots or one broccoli. We used metal garden hoops covered with plastic to create a cold frame effect so we can start plants outside earlier without the risk of freezing. We can also use them for bird netting to protect the seeds from nibbling birds, squirrels and deer. This weekend I started three kind of lettuce, two kind of beets, chives, carrots and sugar snap and snow peas! As the season progresses and gets warmer I will plant more seeds and transplant seedling that I’m starting inside. If you have any questions don’t hesitate to ask! We learned a lot with this project. This entry was posted in Farm-to-Table, Urban Gardening. Bookmark the permalink. I love the Trex decking idea, and had already considered and mentioned the idea to my wife prior to reading your web site. She thought Trex may be toxic and dismissed the idea immediately. Have you discovered any ill effects with Trex. I’m a carpenter and would love to build raised beds similar to yours. I truly appreciate your sharing with the world your concepts and techniques. I especially appreciate knowing that there’s a rhyme and reason to plant spacing in these boxes. Also, the trellis idea is amazing and simple. I’m going to put that idea to good use with my tomatoes this year — I wonder if it works with cucumbers? Thanks for that. I haven’t had any ill effects and I did a bit of research last year, it seemed that any chemicals that may be in the Trex are significantly less then what you would find in pretreated wood which does leach into the soil. 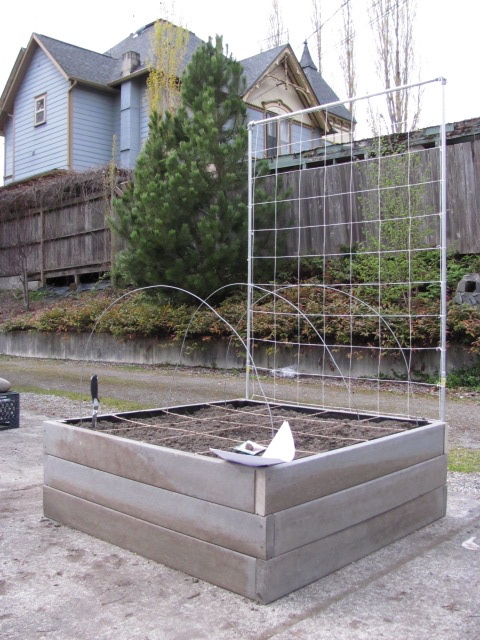 The trellis is perfect for cucumbers, zucchini, and peas. The only challenge I’m having is figuring out how to naturally replenish the essential nutrients in the soil. Since it’s contained it’s like growing veggies in an over-sized flower pot. I’ll do an updated post once I figure that one out. Good luck with your garden and let me know if you have any questions! Hello John Inlow, I am a representative of Trex. I just wanted to let you know that Trex is safe to be used for a raised garden bed application. If you need further information, feel free to contact me at question@trex.com.